An ongoing discussion seems to rear it's head at Western Bitters News on a pretty regular basis. 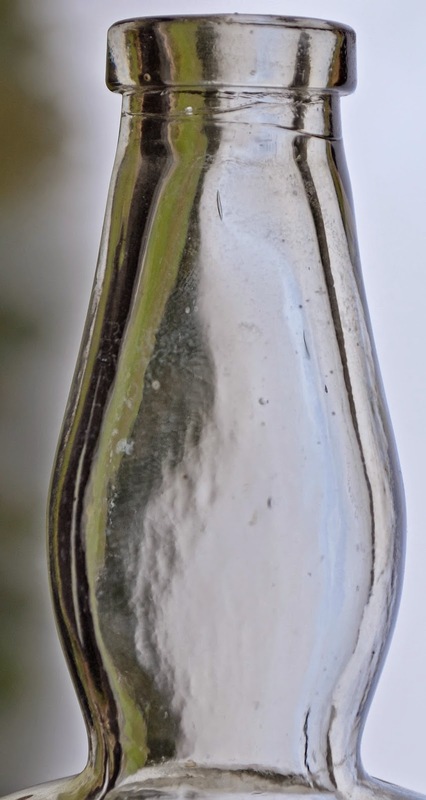 You know the one, (is it a western, or an eastern bottle?). 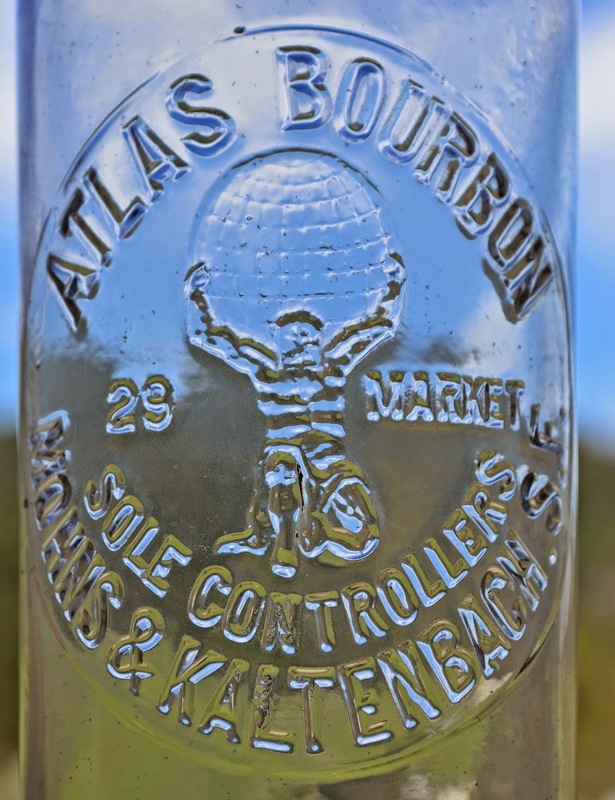 The same thing could also apply to whiskies and advertising shot glasses. A shot came in the other day that had me scratching my head. 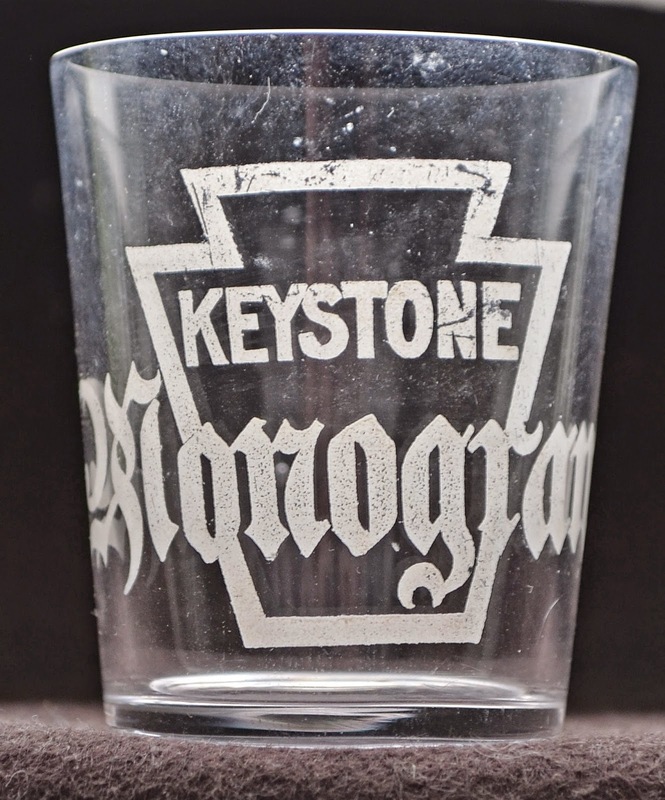 It's got a bold gutsy etch that reads "Keystone Monogram". Eastern, or western? The "Monogram" name and the logo both struck me as being somewhat familiar. 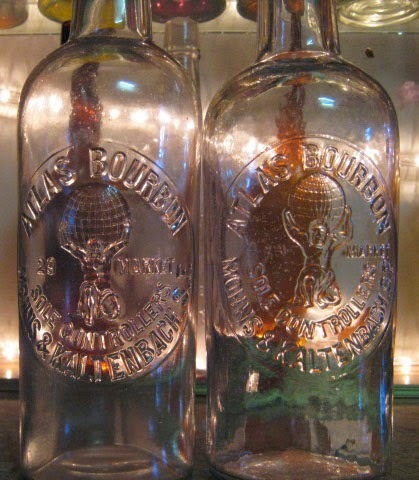 I looked in Wilson first, hoping to see a photo of the bottle, as well as some provenance about the brand. Nothing there under Keystone but sure enough, under Monogram appeared a listing. 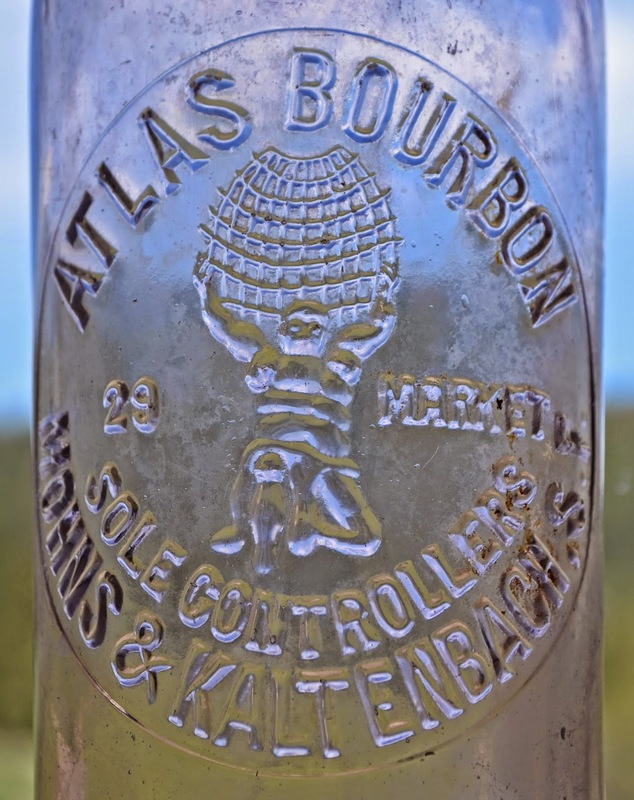 It read Monogram Pure Rye Whiskey / Rosskam, Gerstley & Co. / Sherwood & Sherwood / Sole Agents. Bill dated it ca 1893 - 1905 (probably once again, up to the date of the '06 Earthquake and Fire). 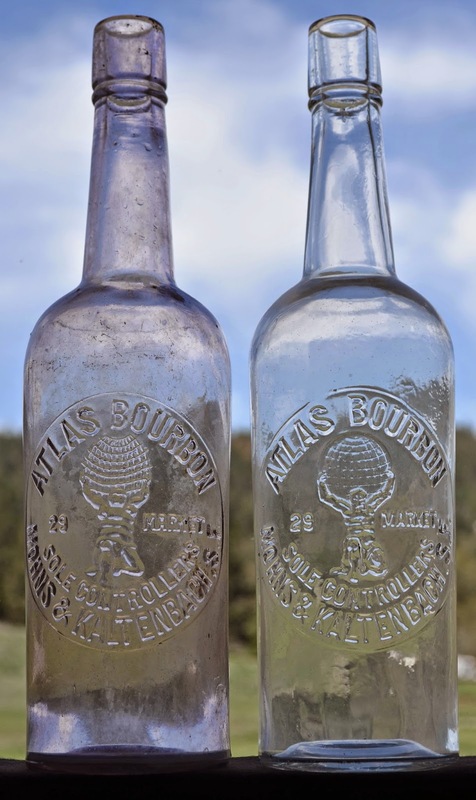 Bob Barnett also listed it in the same time frame and went on to add that the bottle is an amber squat quart, and has been documented with both tooled and applied tops. 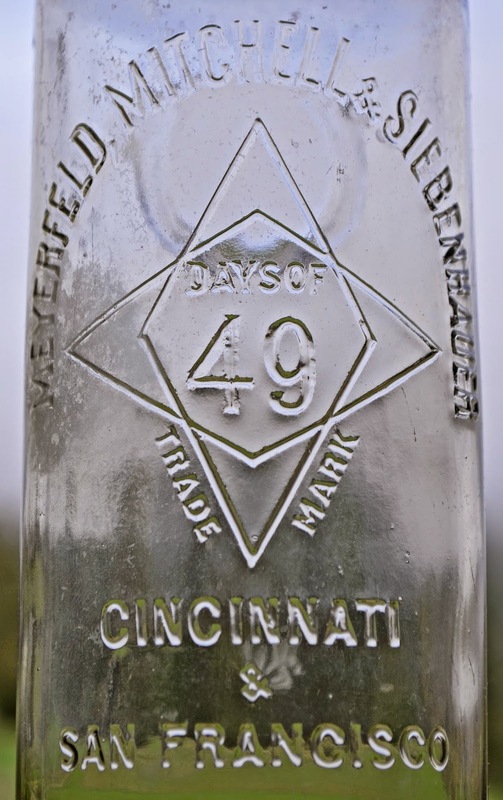 Although the bottle is not embossed with either S. F. or Cal., a quick check of Rosskam, Gerstley & Co. showed that they exported the bulk of their product to the west coast. The name "Sherwood & Sherwood" rang a bell. 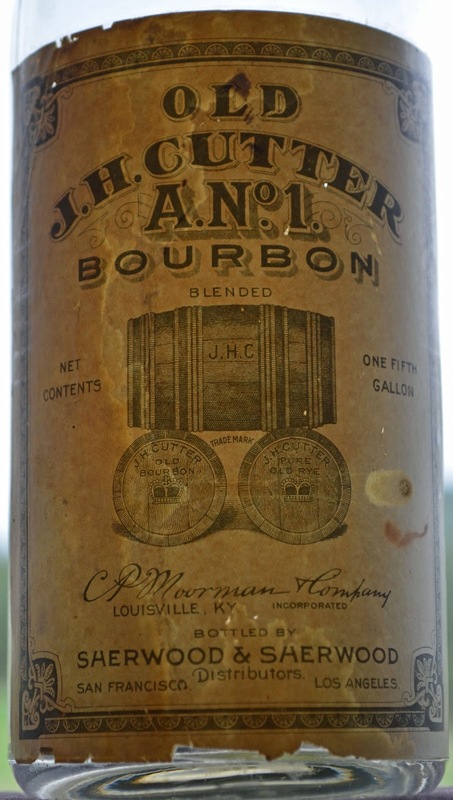 Sure enough, on one of my shelves was a labeled whiskey that once contained J. H. Cutter A No. 1 Bourbon. Front and center at the bottom of the label was the name of Sherwood & Sherwood / Distributors / San Francisco - Los Angeles. It's tooled, and appears ca. 1900. A quick look at the 1900 Crocker / Langley S. F. Directory hit pay dirt. Sure enough, in bold type in Sherwood and Sherwood's advertisement is "Pacific Coast Agents for Keystone Monogram". The brand may have originated in the east, as did Jesse Moore, but I think that this also qualifies the glass to be as Western as it gets.